Rig up your Blackmagic Design Pocket Cinema Camera 4K with this Formfitting Half Cage from CAMVATE. 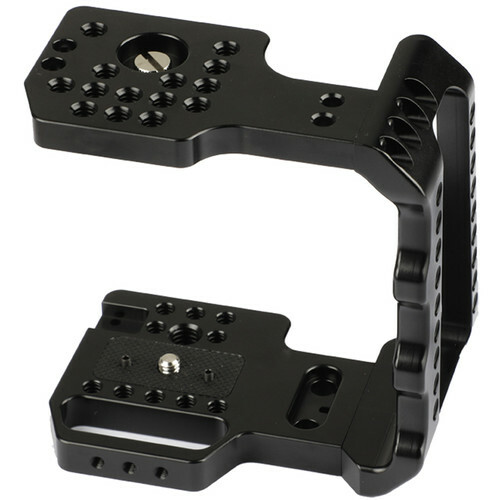 With its formfitting design, this CNC-machined, anodized aluminum half cage protects your camera while leaving all of its vital controls on the right grip and left side easily accessible and viewable. The case provides numerous 1/4"-20, 3/8"-16, and M4 mounting holes on top, sides, and bottom, and uses top and bottom 1/4"-20 screws and two bottom anti-deflection pins to secure your camera. Customize your setup with your choice of separately available accessories such as top handles, quick release baseplates, support rods, and more. Included in the package are a hex key and a flat screwdriver.